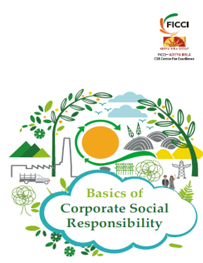 Corporate social Responsibility (CSR) is becoming an influential and important constituent of mainstream corporate agenda in India as well as across the globe. Globally businesses are increasingly acknowledging its importance for inclusive growth and sustainable development. India has a long tradition of close business involvement in social causes for social development. Though a lot of Indian private sector companies such as Tatas and Infosys have done work on corporate philanthropy, CSR in India has still not taken root due to various differing views on the very ABCs of CSR. The handbook is one of the first novel efforts by the FICCI Aditya Birla CSR Centre for Excellence to provide a globally perceived understanding of the term. The handbook was released on August 30, 2012 as a knowledge module for “Training on ISO 26000: Social Responsibility and National Voluntary Guidelines (NVGs) on the Social, Environmental and Economic Responsibilities of Business”.